TRX is an acronym for “total-body resistance exercise,” designed to reach max fitness levels using minimal equipment – just a set of specialized cables. Born in the Navy SEALs, TRX is designed to maximize the effects of gravity and your own bodyweight to get you insanely good shape. Only you and your TRX cables determine how far you can go. 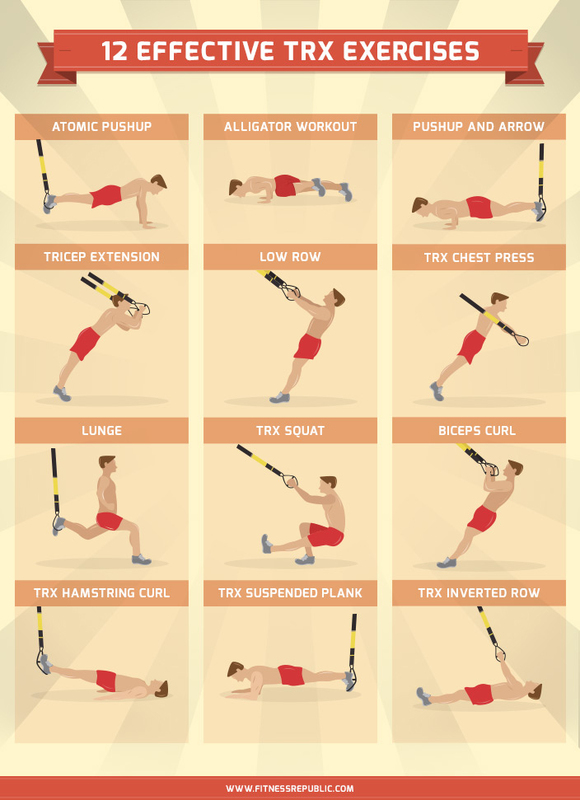 Here are 12 of our favourite TRX exercises for a total-body workout. (Scroll down for the infographic to see how they’re done). An advanced workout that targets the core, chest, arms and shoulders: Get into a push-up position with your feet strapped in the TRX cables. Pull your knees into your upper body to meet your elbows. Hold for two seconds and return to the starting position for one rep.
An intermediate level TRX workout that sculpts the shoulders, back, and obliques, this exercise is worth its weight. Lean back until the lines of the cables are taut and grab both handles using an overhand grip. Alternately pull one line back and upward with one arm while you pull backwards and down with the other. As its name implies, this workout hits the triceps and its surrounding muscles. Grab the pair of suspension lines with an underhand grip. Make sure you’re facing away from the anchor point. Bend your elbows until your hands are behind your head and slowly push to extend your arms back to the starting point. Get ready to work your back, abs, shoulders and biceps to the point of exhaustion. Grab the line handles in a grip that has both palms facing each other. Lean your body back until your weight rests on your heels. Pull your weight back up until your torso touches your hand for one rep.
A chest workout – no barbells or special bench needed! Simply face away from the lines and grip both handles with both hands. Lean away from the line as much as possible so that your body is lined up diagonally, then bed your elbows and lower your chest between your hands. Push yourself back to the start position for one rep.
Sculpt your arms and back with this variation of the row. Lie underneath the TRX lines and grasp the handles with both palms facing each other. Straighten out your arms so your torso is slightly lifted off the ground. Pull your body up so your elbows are bent, and then lower your body back to the starting position to complete a single rep.
With your palms facing each other, grab the handles with both hands while facing the anchor point. Lean back on your heels until the wire becomes taut. Pull your body toward your hand while keeping the wire taut and bending your elbows. You’ll work your abs and strengthen your arms at the same time. Get into the standard pushup position while securing and suspending your feet off the ground in the straps. Do a pushup and then raise your hips so your body forms an upward pointing arrow. This exercise not only strengthens your legs, it also improves balance and core stability. Turn your back on the anchor point and place one foot into both cradles simultaneously. With the other foot, lower your torso into a lunge while keeping the other leg extended behind you. This exercise will strengthen the core, glutes, quads and hamstring areas of the lower body. Even though it’s almost identical to a classic squat, but the cables are used for stability and as an aid when doing high reps. Lie on your back with your head away from the TRX cable. Lift your hip off the ground and place your heels in the foot cradle of the TRX cable. Your arms should be extended at your sides as close to your torso as possible to provide stability. With your heels still in the cradles, pull your knees toward your chest in one fluid motion and return to the start position for one rep.
Align the TRX cables so they’re a few inches off the ground and keep your body in as much of a horizontal straight-line position as possible. Place your feet in the foot cradle with your body facing downward in the regular plank position with your body resting on your forearms and your feet suspended in the cradle. Hold the position for as long as possible.